Original copper engraved map of Cornwall issued in 1610 in William Camden's 'Brittania' based upon the work of Christopher Saxton. The map was engraved by William Kip. One of the very earliest maps of the county. 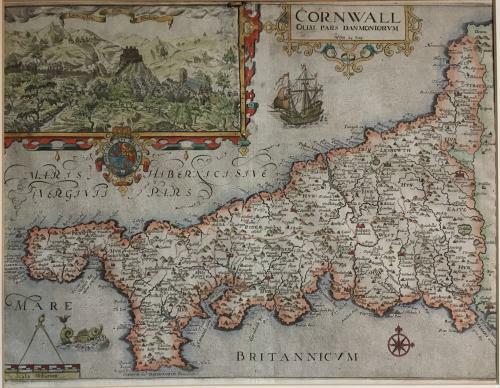 A highly decorative and desirable early map of Cornwall, by William Kip, based on the earlier map by Elizabethan cartographer, Christopher Saxton. Published in William Camden’s “Britannia”. The map is embellished with compass dividers, a sea galleon, a compass rose, a sea monster and a decorative inset of Launceston Castle. The map is very detailed featuring many towns and villages, together with hills, rivers, castles and stately homes. Originally, in 1586, Camden’s work was a detailed historical and topographical description of Britain. Hole & Kip added their maps to this work in 1607. The 1607 edition has latin text printed on the reverse and the later 1637 edition had a plate number added allowing definitive dating to the 1610 edition. The map is in very good condition, mounted and ready for framing.